You heard me. Get a cheapy pack of 100 and blow up about 20 to 30 in one sitting. 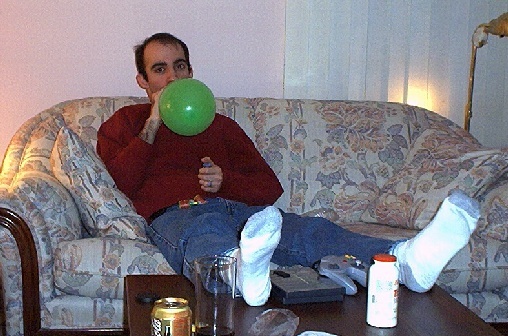 Blowing up balloons is a resistance based exercise for the diaphram, a key muscle not only for breathing, but for overall core strength. If the trunk muscles are weak, the diaphram suffers (and vice versa), as does your breathing…as does your neck and shoulder tension, as does your stress levels….see how all of this is an endless spiral? Increase your lung capacity. Strengthen the diaphram. Build core strength. Release neck and shoulder tension. Let go of stress easier by breathing deeper. 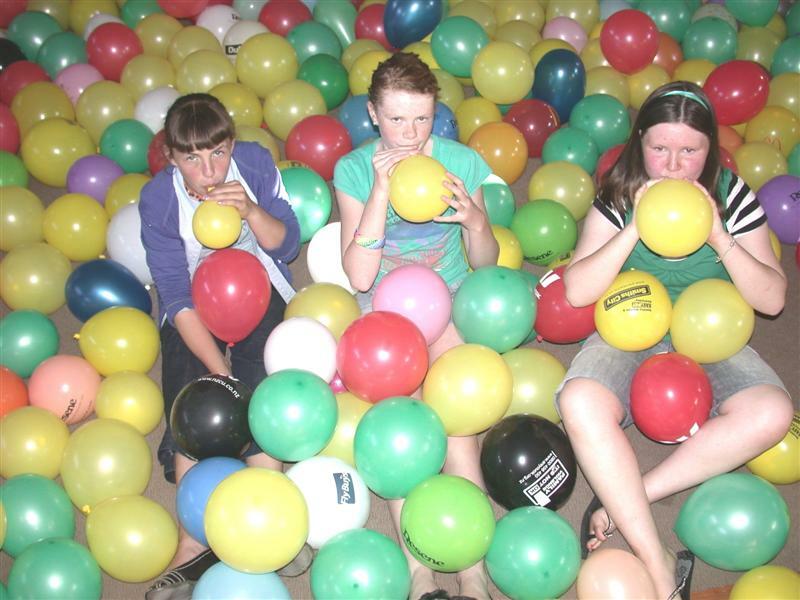 Seems we have nowhere to go but up….go blow up some balloons. The Japanese are willing to try new fads. Theirs is a voracious and open appetite for all things new, quirky and different. Who can blame them? I too might be enticed by the latest gizmos and research, but I’m keeping my skeptical face on…at least until everyone is gone. Teaching Pilates exercises is easy. They are exercises. Teaching clients to control their muscles in Pilates is difficult. Really difficult. Little known fact: Joseph Pilates named his exercise program Contrology – The Art of Control. Just because someone looks good doing an exercise, does not mean they are performing it correctly. In Pilates we are taught to work from the core of the body outwards. Muscle control in Pilates, and for pretty much any movement, should begin with a fundamental understanding of the trunk….or as popular vernacular goes, the core. This understanding, or awareness, of muscles is created by mind-body connections. It’s nothing new-agey or other worldly. It is a combination of cognitive function, motor skills, and neuromuscular training. Being aware means you have knowledge of a muscle and are able to contract it on command. Muscles do have memory. 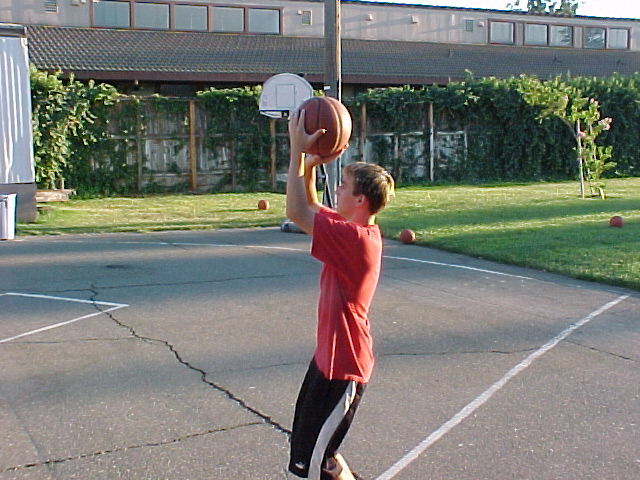 Example: Close your eyes and imagine shooting a basketball into a basket. You can mentally create the action. Hands holding the ball. Feet in proper stance. Knees bend. Energy builds. Push off. Arms extend. And you shoot the perfect three-pointer…whether or not you made that mental basket is best left for a psychologist’s blog. Point is, you can feel the movement without moving. That is muscle memory. A large part of a Pilates instructor’s job is finding the right key to help you unlock mind-body connections. The key could be a word, or an image, or a feeling, but once able to contract or lengthen the specific muscle upon command, you have now created new muscle memory. Eric Franklin is a movement educator creating mind-body connections by playing with imagery. Franklin supplements movement training with brain and body exploration. Again, it sounds new-agey. Trust me. It’s legit. Connecting creative thought patterns and feelings with the physical body can bring about new muscular connections. Franklin’s methodology is a nice complement to any Pilates, physical therapy, or exercise practice. Subtle imagery cues can make a large impact on muscle control down the road. Starting small in your movement is a sound way to begin proper muscle control. Classic Pilates imagery cue: Imagine you are trying on a pair of tight pants. The zipper is almost zipped. There is about one inch left. Take a deep breath and draw everything up and in so you can draw that last little bit of zipper up! This image helps people feel the deep abdominal muscles. Once felt, it’s easier to understand how to contract them at will. Attaining muscle control and knowledge of your own body keeps you strong and flexible. #1. Your best bet is to start working with a knowledgeable trainer. Let them help you assess your body and find the best way to progress. Every body is different and to find your particular muscular control pattern is a personal battle. #2. 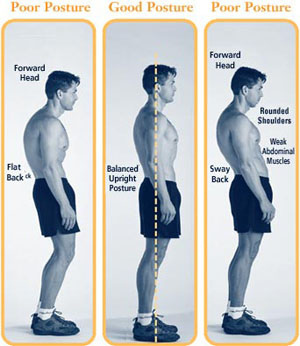 Practice small fundamental movements regularly to create more mind-body neuromuscular connections. IDEA Health and Fitness Association offers a nice list of some tried and true core connecting moves. Pick one or two that work for you. For more information on the Eric Franklin and his movement method, check out his website. China’s economic growth will be bringing unique brands to the global market, enticing the eyes and wallets of people wanting something new. We are still ahead of the curve, but trust me, they are on their way. Sports in China are big. They have served China as a bridge to the outside world to showcase the country’s strength. Now that commercial sports marketing has edged it’s way in, sporting style is more popular than ever, and basketball leads the pack. Basketball’s got style. Nike has Yao Ming. 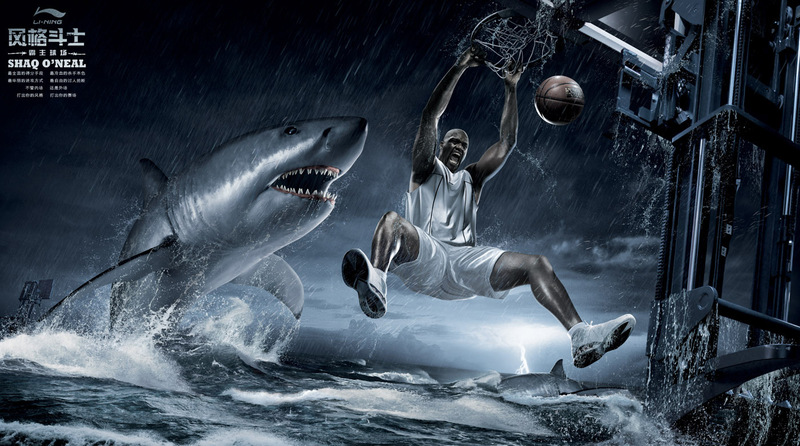 And now, China’s got Shaq. All things Western still maintain a certain cache, but, China has it’s own popular sporting brand directly competing with Nike…Meet Li-Ning. Although the Li-Ning logo bears a striking resemblance to the Nike swoosh, the company claims it represents the bounding energy exuded by brand founder and former gymnast, Mr. Li-Ning. 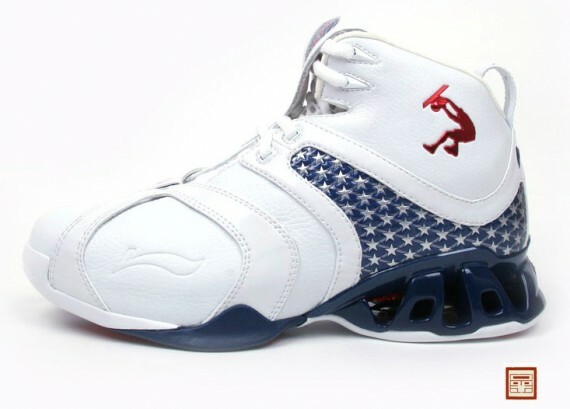 Li-Ning was a six time gold medal winning gymnast in the 1984 Summer Olympics. 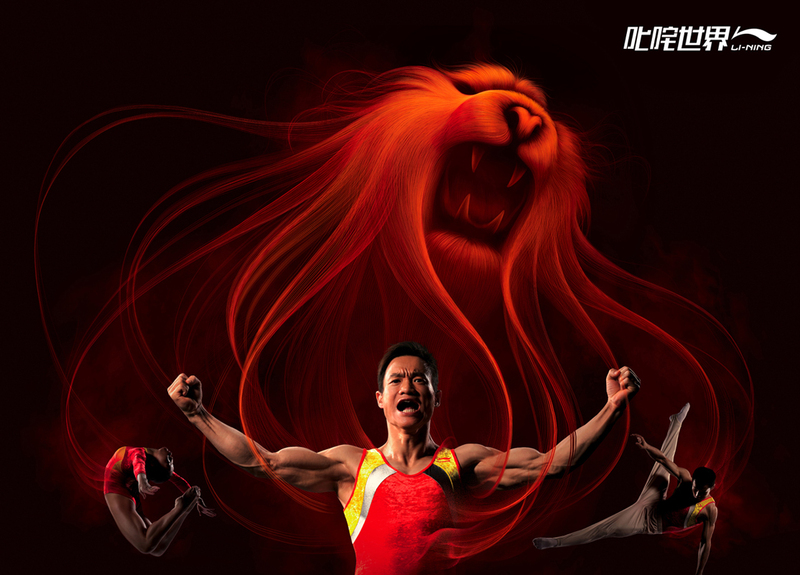 The company was formed under the guidance of the Chinese Olympic Committee in 1990, and has since skyrocketed to success within China in the past decade. If you are a die hard basketball fan in the mood for something different, you could always make Li-Ning your thing. 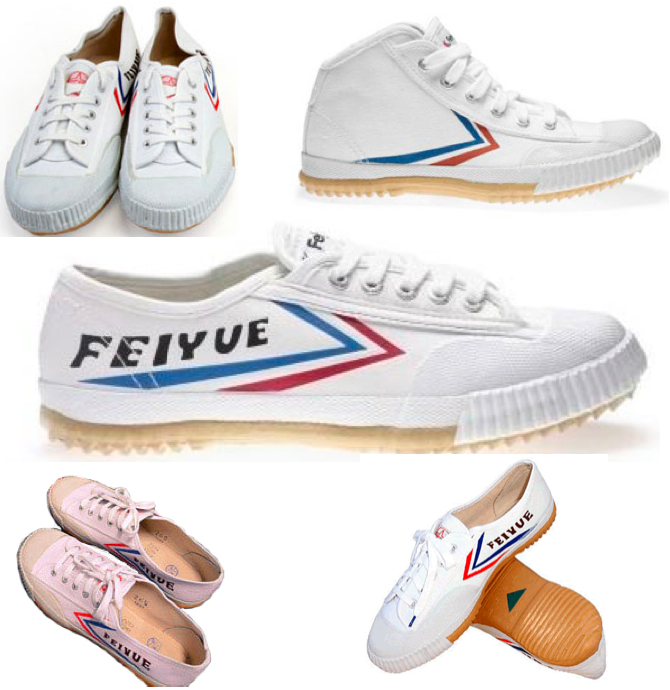 If you are looking for something with a little more street cred from those in the “China know”, go back several more decades to the 1930’s and pick up the choice shoe of the martial arts set, the Feiyue. 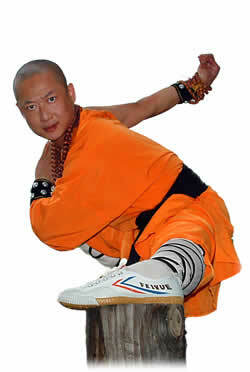 So cool is this old school Shaolin Monk shoe, that a French company has bought the rights and upped the design, and the price. To remain true to Chinese sporting chic, best bet is to find a martial arts store, or go to amazon, where they sell the originals for a few bucks. Feiyues are surprising comfortable, if not exactly supportive. So there you go – a few ways to embrace the China Chic before the curve sets in. It’s like shooting a three-pointer from the mountain top, crane style. Spring 2010 is flourishing with whimsical inspiration. This circus is coming to town this Spring. Vintage lingerie and circus motifs, reminiscent of the early 20th century, are pervasive. Dripping with silks and lace the vibe is, like the old HBO show carnivale, a little dark, a little dusty, but deeply romantic. 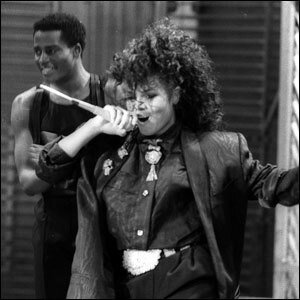 Fashion can inspire us to move as much as movement can inspire fashion. Who hasn’t at one point dreamed of being a character in the circus? Ringmaster, trapeze artist, tight rope walker, juggler, clown, acrobat, etc. 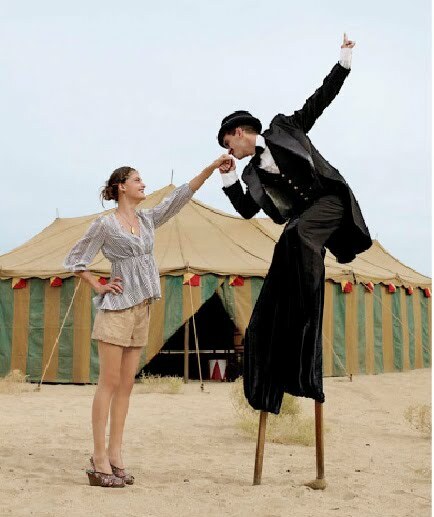 This Spring is the perfect time to add that signature piece from your circus fantasies into your wardrobe – the top hat, the tulle skirt, the jacket with coattails (maybe skip the red clown nose) – incorporating a little personal magic. While embracing the whimsy of spring fashion trends, why not sign up for a juggling class, trapeze class, or clown school? Who says exercise and health can’t be a three ring circus of fashion, feeling pretty, and having fun. Stop what you are doing! Take a one minute movement break, and try this simple move below. Keeping with the recent upper body theme, here is a great movement to relieve neck and shoulder tension while promoting shoulder mobility. Gently touch fingertips to shoulders. Reach outward to opposite walls through your elbows. Draw large smooth circles in space with the elbows. Take Deep Breaths. Keep you head floating up towards the ceiling. Shoulder fun fact: The shoulder blades are not connected to any other bone in the body, but fixed in the body with merely a few muscles. The human shoulder is crazy complex. It’s built for movement and dexterity. Countless problems stem from imbalances within it’s fine inner-workings. 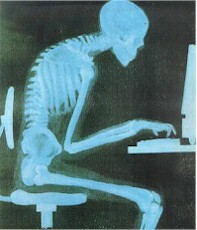 The most prevalent shoulder problems stem from sitting all day. Go figure. Whether standing or sitting, the human body is built to turn inward; naturally possessing more muscle mass that turns us inward than outward. 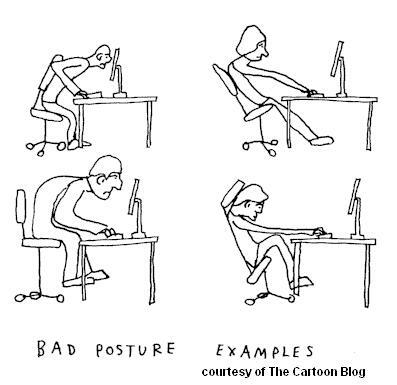 Perfectly formed to slump back in a chair, or round forward over the desk. Sitting this way from kindergarten through now at your computer, it’s a safe bet you’ve experienced neck and shoulder tension. We are so used to allowing our neck to tense and our shoulders to round forward, that they take over everything we do, down to our abdominal exercises. TRY THIS TEST: Sit on the floor. Bend your knees together. Try curling half-way back, scoop the belly, and hold. 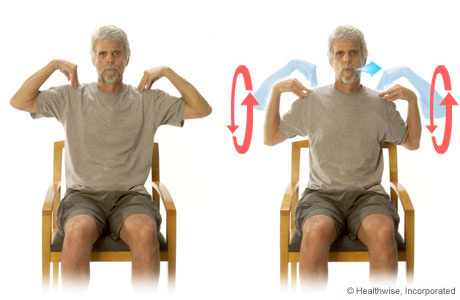 See if you can completely relax your shoulders and hold the curled position. If your fall backwards = Your abdominals are weak and the upper body pushes you through most core movements. Our shoulders and hips can act like a barrier surrounding the core muscles. To strengthen the core of the body, we must learn to let go of tension. Pilates and muscle awareness helps correct this by building strength from the inside out. Muscle of interest #1 – The Rhomboids. They pull your shoulder blades together. Imagine cracking a walnut between your shoulder blades, those are your rhomboids. Muscle of interest #2. 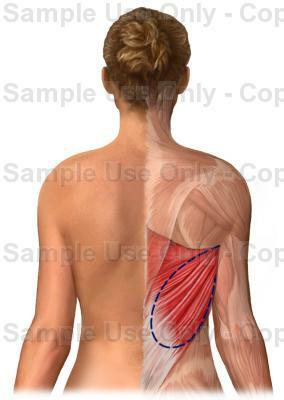 – The Latissimus Dorsi. They connect the upper body to the hips. 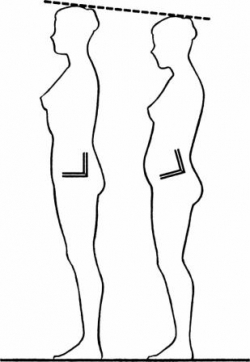 Imaging drawing you armpits towards the hips, those are your latissimus dorsi. Strengthening these muscles will help allow for a stretch in the upper back and neck. Engaging the rhomboids and the latissimus dorsi (lats) allow neck and shoulder tension to release and that energy to be channeled into shiny new postural alignment. 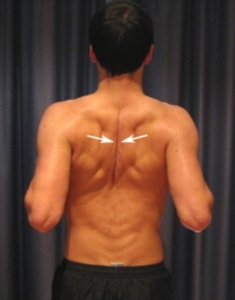 Try this: Imagine drawing the shoulder blades down and together creating the point of a V at the mid back. Feel the chest stretch open, while constantly allowing your head to drift up towards the sky. This simultaneous contraction and stretch allows for deeper breathing and over all better well being. One note: Don’t force or hold for too long. Gently contract, hold for a moment, then release. Keep at it. I recommend investing in an elastic band. 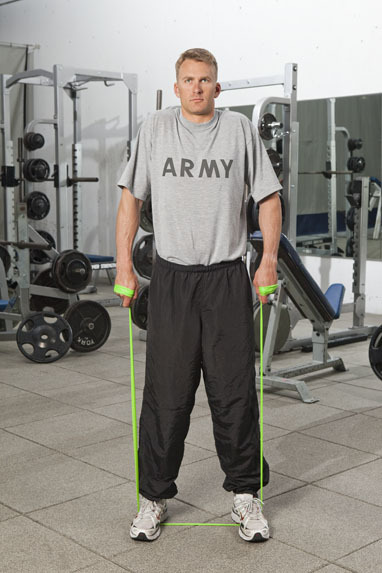 Shoulder Shrugs: Stand on the band, arms by your side. 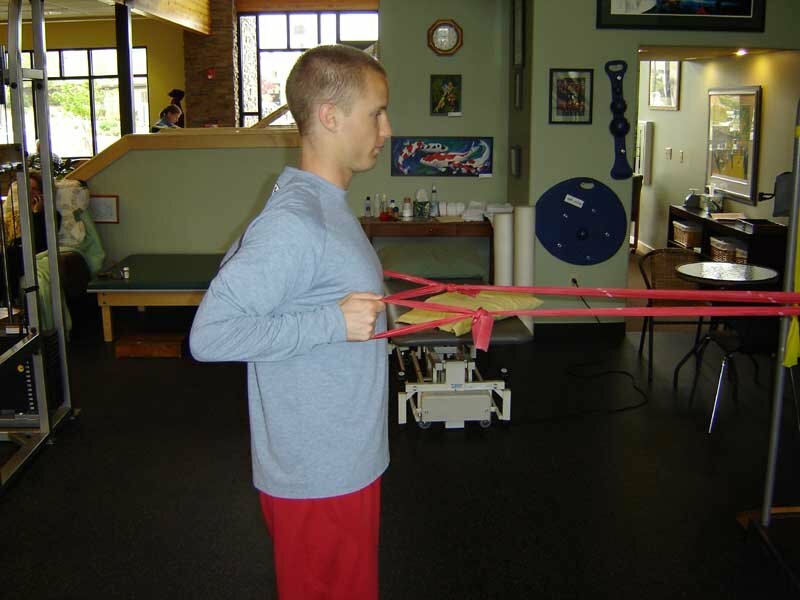 Shrug shoulders up and down, allowing band to gently stretch the shoulders downward. Head is constantly drifting up towards the ceiling. Rowing: Wrapping the band securely around a door knob or fixed point. Lead elbows back towards each other. Head is lifted. Shoulders squeeze back.Crack the walnut between shoulder blades. 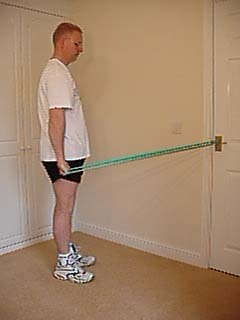 Chest Expansion: Wrapping the band securely around a door knob or fixed point. Draw straight arms down and back. Aiming fists towards your heels. Squeeze shoulder blades together. Head drifts upward. Neck is long. More details on these and other exercise can be found at here and here. A few simple, quality moves with moderate weight (or resistance) and a focus on breath is far better than a massage or a static stretch for releasing neck and shoulder tension. Building proper muscle strength gives the tension a place to live, rather than allowing it to set up camp in your neck a few hours later. Quality of movement is more important than quantity. Find little movements all day long that create length, strength, and stretch.